The images provided by satellite imaging company ImageSat International (ISI), yet to be independently verified, offer an overview of some of the damage caused by Israeli bombing of what are claimed to be Iranian military positions. — imagesatintl (@imagesatint) 13 мая 2018 г.
ISI's 'preliminary damage assessment' seemingly depicts the destruction at the Damascus International Airport, including the ruins of a 30x15 meter storage structure. Satellite images also show an evacuated 'Glasshouse', the nickname for what Israeli analysts claim is Damascus-based headquarters for Iran's military operation in Syria. The satellite images follow the release of aerial images by the Israeli Defense Forces of what it claimed were "Iranian sites in Syria." — IDF (@IDFSpokesperson) 11 мая 2018 г.
Israel launched a massive airstrike against what it said were 60 'Iranian' military targets in Syria late last week, calling the measure retaliation for the firing of nearly two dozen rockets into the Israeli-occupied Golan Heights. According to Israeli media, none of the rockets reportedly made it into Israeli territory. According to the IDF, all the targets in the May 10 attack involved Iranian Revolutionary Guard Corps' Quds Force troops. According to the Israeli military, its targets included intelligence, logistics and weapons storage facilities, a military compound, as well as targets in the buffer zone (i.e. the territory between Israeli and Syrian forces) along the border between the two countries. Conflicting reports have emerged regarding the effectiveness of the Israeli Air Force's attack. 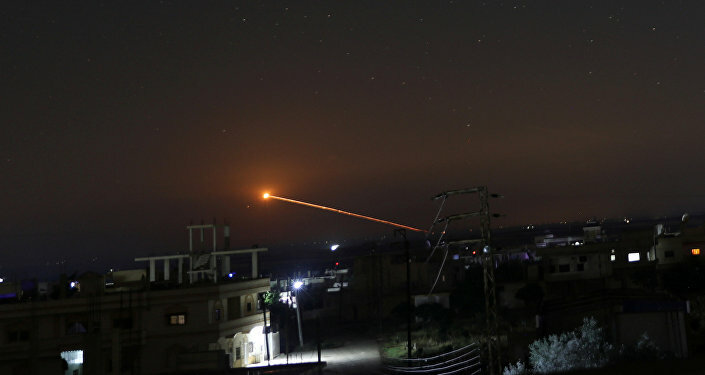 According to the Russian military, Syrian air defenses downed "over half" of the missiles launched by Israeli F-15s and F-16s. For its part, the Russian foreign ministry has voiced its concern over the Israeli attack, and called on all sides to exercise restraint.